It's not exactly been intentional, but these last few years when I've been away, I've ended up visiting areas and places that I have frankly neglected. 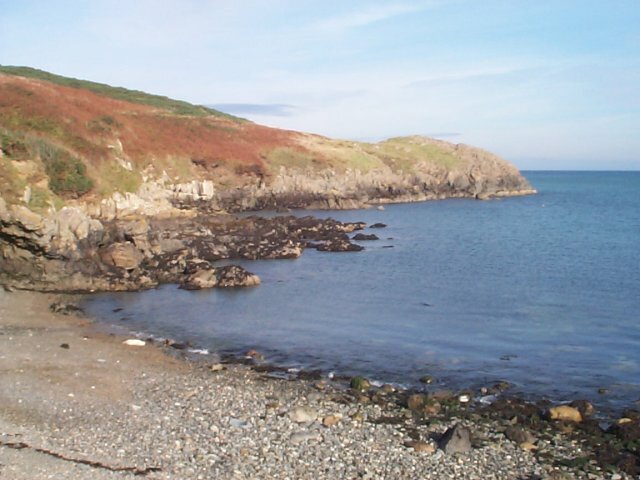 I had been to Pembrokeshire in south-west Wales with my family a very long time ago, but not really in living memory, and nor do I get to see anywhere near enough of my more remote-living family members. 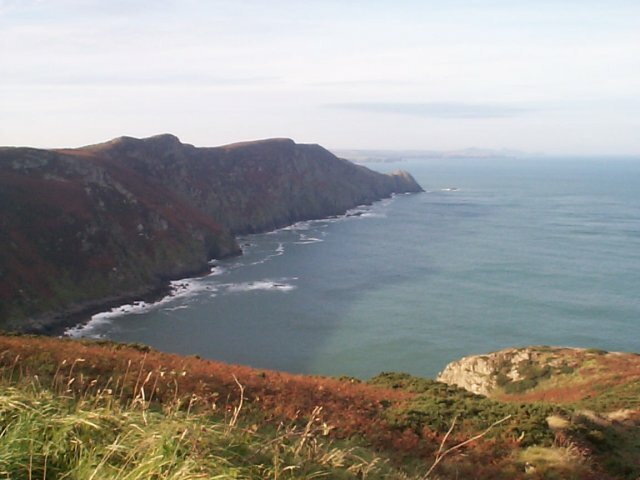 So it was a great opportunity for my 2001 holiday to go and put a few wrongs to right, and I booked myself in at a couple of Pembrokeshire youth hostels and arranged to stay at my sister's house just outside Hereford for a night on the sofa en route. 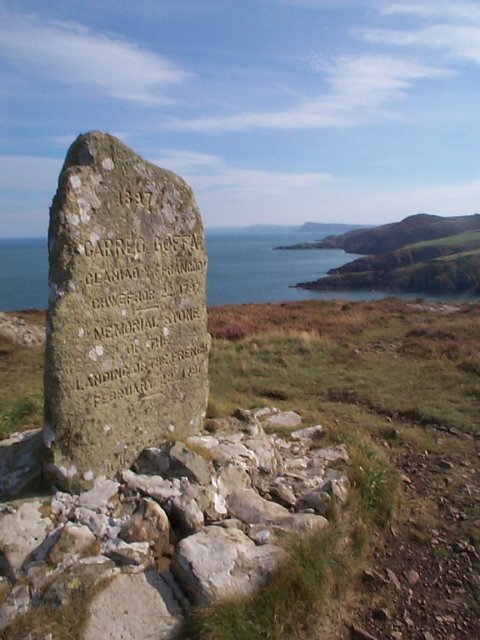 Quite by chance, I'd found that the two Pembrokeshire walks contained in a book I'd been given as a birthday present earlier in the year, The AA Pocket Book of Britain's Walks, were within a stone's throw of the two hostels I had booked into. 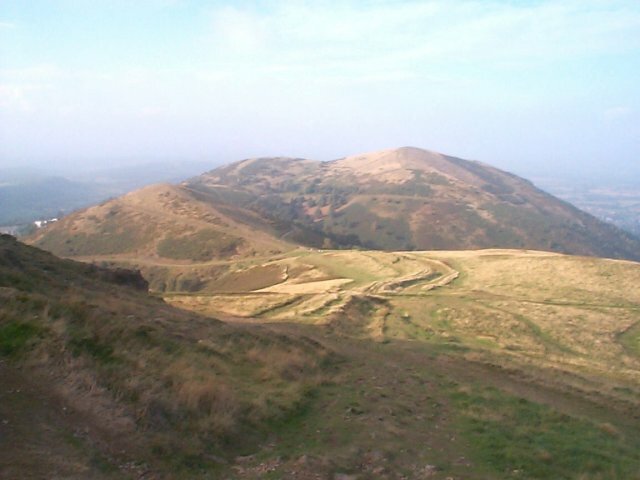 By perhaps a little less chance, it also contained a rather lovely walk a little my side of Hereford, up on the Malvern Hills. It was a bit tougher than I had expected, and consequently took quite a bit longer than anticipated, but even with it a bit hazy there were still some fantastic views to be had and it was tremendously good exercise for me I am quite sure! So I was much later arriving at my sister's house in Hereford than I had planned, but I was still in time for tea and to help with getting the littler ones off to bed. I didn't get too late a night myself, but didn't sleep too brilliantly on the sofa, so it was just as well there was no great rush to get away the following morning and it was a good opportunity to catch up with my sister about all kinds of happenings in our respective lives. It was a damp drive to Dale the following morning, and I very nearly never got there thanks to a major accident on the tiny road that was the sole access to the village and peninsula. But I made it in the end, and wrapped up in plenty of waterproofs before striking out on the AA's recommended walk around the coast path. 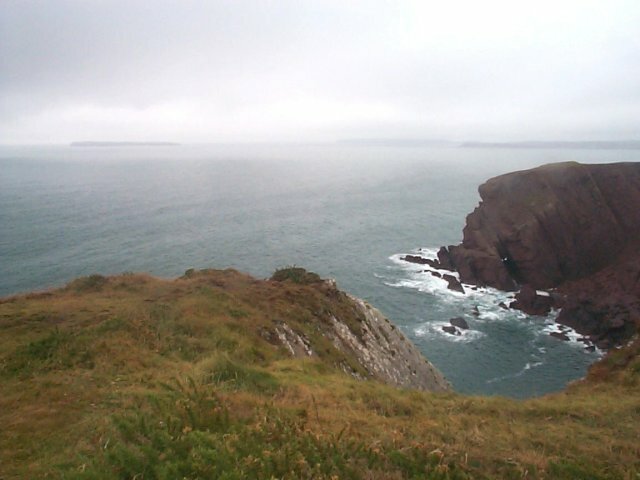 Skokholm and Skomer islands and the Milford Haven oil terminals and refineries were grey blobs in the murk, but the views were still spectacular - in a bleak kind of way - and the weather did cheer up to a certain degree as the afternoon went on. 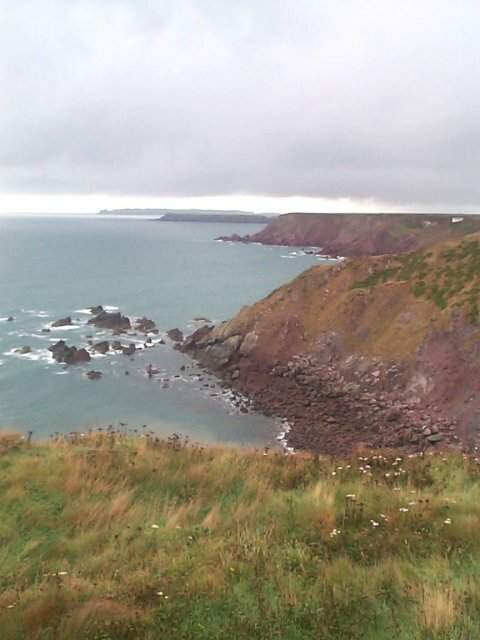 It was a short hop from where I'd parked to Marloes Sands youth hostel, where I got another rather bad night's sleep, mainly thanks to the rain pounding on the plastic roof of the converted cow-shed that was my dormitory. 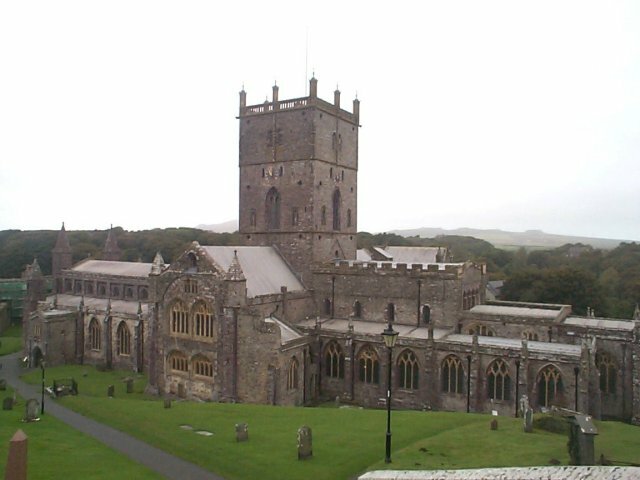 Thursday was another rather bleak day, so I decided I'd spend it in and around St David's, the smallest city in the United Kingdom, on the other side of St Bride's Bay. 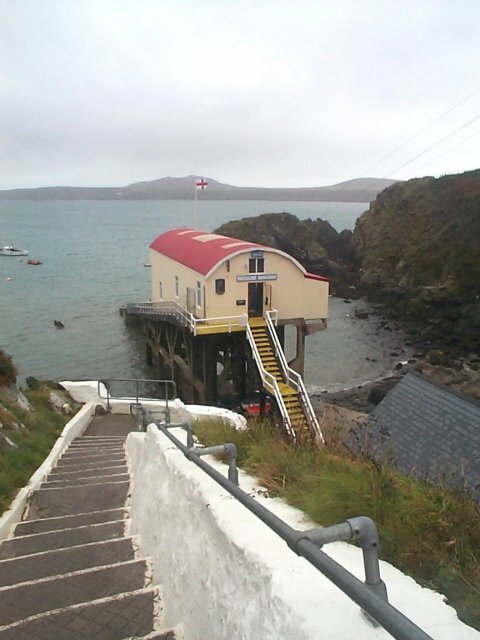 However, while waiting for the accident to clear the day before, my mum had phoned recommending I check out the boat trips running from near St David's, and a couple I had met had mentioned them too, so I duly investigated. The recommended company were in fact the only people operating on such a rough day, so I booked my place and had a look round the city aquariums before making my way to the lifeboat station and slipway a couple of miles out of town. Needless to say, the boat trip was amazing and well worth the ticket price. 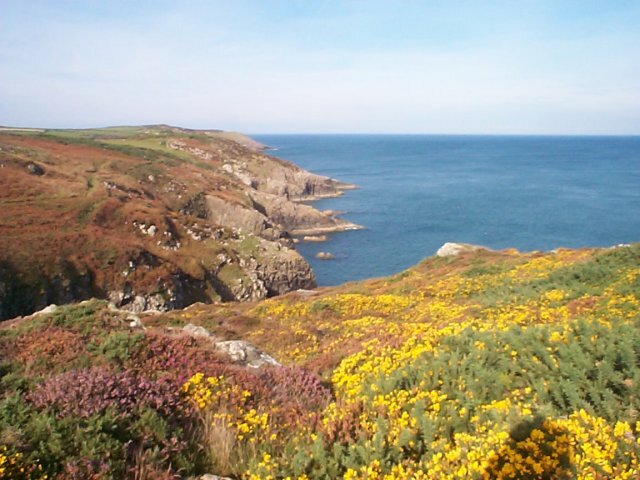 It took us round Ramsey Island, owned by the RSPB and home to many different birds and mammals, and we saw loads of seals of all ages, porpoise and sea-birds. With the choppy weather conditions, it was an exhilarating ride, and we could well understand why ours was the only boat allowed out! Back in St David's just a little too early to go on to the hostel, I had a look round the cathedral and some of the city's numerous art galleries - and saw some lovely pictures for whenever I eventually set up my own home! 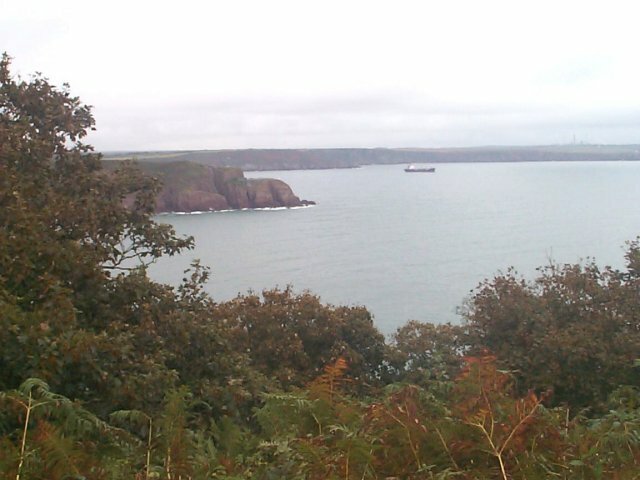 From St David's, I drove on north to Pwll Deri youth hostel for the night. Its cliff-top location was truly spectacular, as I had been previously advised. The weather was still inclement, and we had to strategically place a fair few buckets around the hostel to catch the drips! The dormitories were warm and snug, however, and I consequently managed my best night's sleep of the holiday there. 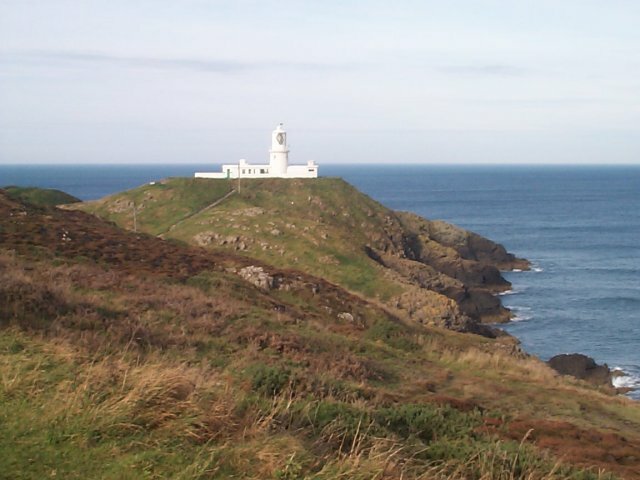 This was my final day, but before I left for home, I took the AA walk around the nearby Strumble Head. It wasn't quite as much of a peninsula as Dale was, so there was more inland walking to be done to make a complete circuit, but it was still spectacular and finally the weather gave way to truly beautiful conditions for the first time, so my camera was busy! There were a few more seals and so on to be seen, including a couple of pups. Back at the car and after a bite of lunch I took one last stroll down to the bridge to the lighthouse and bid the Pembrokeshire coast farewell - but hopefully not for another twenty-odd years! This account last modified on 20 July 2002 by David Gosnell. All photographs ©2001 David Gosnell.